“Do your homework, study hard, and make good grades.” We all probably heard those instructions many times during our school years. When viewing the relationship between educational attainment and earning power, this advice can be validated by cold, hard facts. According to the 2014, 4th quarter report, The Usual Weekly Earnings of Wage and Salary Workers from the U.S. Bureau of Labor Statistics, full-time workers age 25 and older with no high school diploma earned a weekly median wage of less than $500, compared to $664 for high school graduates with no college, and $1,224 for those holding at least a Bachelor’s degree. Income disparity is even more startling when viewed over a working lifetime. Information in the Majors Matter article from the Donnell-Kay Foundation notes that on average, over a supposed working lifetime of 39 years, employees with less than a high school education may earn only $973,000. Conversely, a Bachelor’s degree is worth $2.8 million; professional and graduate degrees are even more valuable, at more than $3.6 million. The Donnell-Kay article also notes that lifetime earnings of workers with comparable Bachelor’s degrees may vary according to occupation. For example, a computer software engineer’s average lifetime earnings could be $3.6 million versus a retail store manager who takes home $1.8 million. As noted in an article by the Pew Research Center, a new academic study links rising income disparity to assortative mating—the tendency of people with similar characteristics to marry. An international team of economists headed by Jeremy Greenwood of the University of Pennsylvania, theorizes that better educated people are more likely to marry other well-educated people, whereas those with less education would probably choose a less educated partner. The Pew Research Center states in the growing economic clout of the college educated that for the first time on record, households headed by someone with at least a Bachelor’s degree received nearly half (49.7 percent) of aggregate U.S. household income; nearly one out of every two dollars went to the college educated. Income differences among educated and less educated widen even further because members of college-educated households are more likely to be married, and therefore more likely to have secondary earners contributing to the household income. The article also notes that from 1991 to 2012, income increased 9 percent for households with a Bachelor’s degree, and 20 percent for households with a professional degree. Household income declined for households with no college degree. Unemployment is also influenced by educational attainment. In 2013, the Bureau of Labor Statistics noted that the unemployment rate for those with a doctoral degree was only 2.2 percent, while the unemployment rate for those who didn’t graduate from high school was 11 percent. These figures are for full-time or salaried employees age 25 years or older, reflect only the highest rate of education attained, and do not include completion of training programs or apprenticeships. So, did you “Do your homework, study hard, and make good grades”? It’s probably not too late! 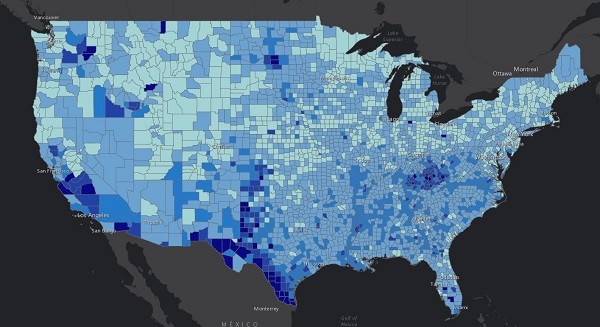 Data for educational attainment and income is available from Esri Demographics.